I once again find myself sitting on a porch overlooking a night sky, and this time the moon appears to be full. The light reflects off the remaining snowfields, creating a unique scene for those whose eyes are well adjusted to the dark. But the adventure I'm writing about now already happened, and right now my eyes are squinting at a too-small screen while I should be sleeping. We decided it was time to check out the back side of RMNP, where I had never been on my previous trips to these mountains. The road over the Continental Divide makes for a fantastic drive, with some of the most incredible mountain views one could wish for. At one of the pull-offs, a little Marmot-buddy was chomping down and was surprised to have been spotted. On the road near Timber Creek campsite we happened upon a herd of elk... and we grabbed a site for a few nights to call our home. The next day we set out to hike up to one of the high alpine lakes holding Cutthroats on this side of the park. We set an ambitious goal, hiking over 5 miles each way. At the entrance to the trailhead, we were greeted with this sign. I wasn't sure what to expect, and it certainly added a sense of uncertainty on top of the aggressive distance goal for the day. The trail started out innocently enough, but soon we were into some classic west coast switchbacks. This side of the mountain was very green, with some small boggy areas that reminded me of back home. But after a while that gave way to a more classic western mountain setting, complete with high-altitude meadow streams and small grassy valleys below the trail. We soon arrived at the landslide, which was much less of a big deal than the warning had suggested. We noticed it had settled well, and that the route was well traveled and safe at the moment. No big deal, just a bit of careful stepping for a few hundred feet. Before we knew it, we were at the other side and back on stable trail. At one of the trail junctions, we tried fishing the outlet stream from the lake, which seemed just about perfect... but all I got was one tap, and Rob got nothing. I think the cutties up in the stream were still either in spawning mode, or the water was still just a bit too cold and high... as is the case along a lot of the trip so far... we were still early for the streams. Soon we reached a meadow that I named "lower moose meadow," as we ended up encountering moose both here, as well as in another spot higher up on the trail. There was a lot of interesting ground cover... I spotted some lichen, mini-flowers and mini-bushy plants that are so interesting if you get close and take a look. The area immediately below the lake I named "upper moose meadow," as we ran into our second moose there. We nervously talked to the moose as we walked by, hoping he would ignore us, and he did. There was snow on the final pitch, but not very much. The trail mostly had skirted the areas that held the most snow, which was helpful for our pace. We made pretty good time, arriving at the lake early in the afternoon with plenty of time to fish. There was a skinny outlet with spawning cutthroats in it, and those not spawning didn't want anything to do with Rob's fly. ... for the view at the lake was truly breathtaking. There was an impressive bowl and some incredibly beautiful and tall cliffs surrounding us... we knew higher peaks lurked in the background but we didn't have time to tackle them on this day. And so I extended my rod and began to fish. At first, nothing. Then I found a nice group of fish stacked up in a post-spawn feeding frenzy at the inlet. My second fish was much more colorful... a real beauty. After a couple of fish caught and released, Rob jumped in and grabbed one as well. His first fish had some striking colors, too. After the other fish were thoroughly spooked, we walked up to a still half-frozen upper lake just above the main lake. It held a few fish, but was absolutely freezing cold and I couldn't feel my feet in only a few seconds. Stepping out, we saw a hiker descending from a depression in the cliffs above. He made fast time, and stopped to chat with us on his way. He had just navigated up to a mountain over 12K, having made the hike to the summit from the upper lake in just 55 minutes. Impressive. On our way out, we ran into two hikers with dogs... let's just call them Richie Rainier and Jim Jollygood. Well Richie Rainier and Jim Jollygood had no backpacks... no extra layers, no food, 2 empty gatorades, one empty water bottle, and 4 joints. (Now also gone.) We laughed about this as I refilled one of their water bottles with my filter. Richie Rainier told us that they didn't look at the map and "had no idea how long it would take." Jim Jollygood complained of a headache and dizziness. It is hard to believe just how much this kind of interaction occurred up at high altitude during our hikes in the Front Range... people are just crazy sometimes, and so unprepared... and I am surprised there aren't more rescues and issues on the trails regularly. Rob gave them a stern warning about not being unprepared again and we set off down the trail and back toward the car. The hike went quickly as we made excellent time back to the car, laughing about the interactions from the day; happy that we had made the hike, caught some fish, and returned before dark without feeling too destroyed. I declared that I was finally fully acclimated, and it felt good. That night the sunset was beautiful after some stormy weather blew through. Also following the weather was that same herd of elk, moving up through the valley and into the campsite. The elk were grazing around the tents and came closer than I really wanted... such is nature! At least they didn't try on the guy lines. After the Elk bedded down next to our tents, we studied the map and our book to find a few more suitable routes for our upcoming days - and then went to bed feeling accomplished and ready for more. As I lay in my tent listening to the elk breathing heavily, almost wheezing, I thought about how surreal this adventure has been in many ways... but also how real it is, and how impactful all of these scenes and experiences have been on me so far. I know this trip will create many vivid and some surreal memories, forever imprinted in my mind... memories and images that I can reach for down the line when I need them most. Given this reality, I am going to dump a bunch of photos that will tell their own stories, while I work on the next high alpine lake post. I'll probably end up doing a couple of these in between... enjoy! Since the rivers were all still melting out, we decided to hit another high alpine lake. Rob and I got lucky and scored 3 nights at Glacier Basin Campground in Rocky Mountain National Park on a walk up... what were the chances of that!? That gave us the opportunity to plan a day up at a lake I've been wanting to fish since last time I was in Colorado. We got there pretty early for parking, and headed up the trail... but not without fishing a few holes in the river first. 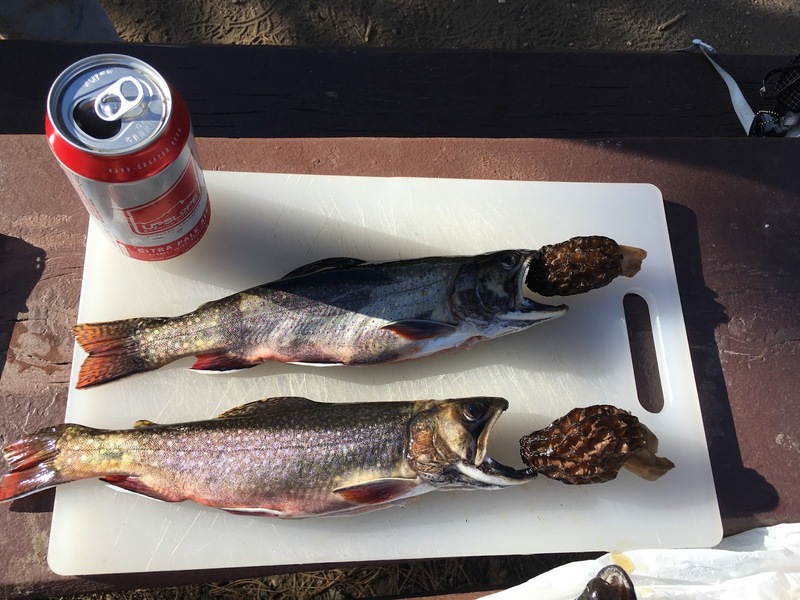 I grabbed a nice brookie, and released him back to the river, mostly because we had a long day and it was way too early to be keeping any fish - invasive species or not. The trail was dry, in great shape, and we made very good time to the first junction. The river was raging up here, being that the water is forced between solid rock in a rather impressive canyon that has some interesting features to it. All this water continued to provide life for the wildflowers, which we were truly enjoying. The hike was not easy, gaining some elevation with a few intense switchbacks. I was slowly beginning to acclimate, but still needed a few more days to tackle this kind of hike with relative ease. A few waterfalls provided good places for rest and reminded us just how much water was still moving down into the main stems of the rivers. After what seemed like more than the claimed mileage to the lake, we were still just below it, and we began to hear thunder. I decided it was worth waiting it out, and luckily the storm passed. We were soon at the lake, and very happy to be there. Another small storm rolled in as we took a moment for water and some lunch. 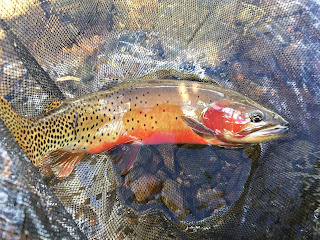 As soon as it passed, we fished and I was immediately rewarded with a nice Cutthroat. The lake was calm in between bouts of strong wind, and that provided just the time needed to get a few good casts and drifts out to the obviously hungry trout. Rob and I each caught a good number of these beauties, and we released them quickly back to their homes in the lake. I was doing much better at altitude on this hike than the last one, which was a good sign. The good fishing helped too, and I did my best to adapt as the fishing turned on and off for the remainder of the afternoon. Some of the Cutties appeared almost ready to spawn, and in the outlet we saw what looked like the beginning of spawning behavior. Leaving those fish alone, I moved to take some photos and enjoy the surroundings. Fish were feeding on the surface to very small bugs, but were also taking manipulated flies down deep. The lake was tranquil for the afternoon, and we fished almost all the way around. The colors of these fish were just stunning, and I am really glad we had a shot at fishing this particular lake under these prime conditions. And then the sky began to darken, so we headed down. Just as we arrived at the flat part of the trail, the clouds closed in and began to threaten the arrival of another storm. It rained for the last half mile or so, but we had our trekking umbrellas and stayed dry. It made for a nice walk out... accentuating the smells of this different and unfamiliar forest. That night we enjoyed stellar views of the sunset with dramatic clouds of all different types. Glacier Basin campground ended up being a great spot to camp, and I hope I can come back here to camp again soon!